The speakeasy trend has entered Tennessee to much applause. This nostalgia-style hangout is so much more than your average bar, offering a laid-back vibe, craft cocktails, and a tucked away locale. 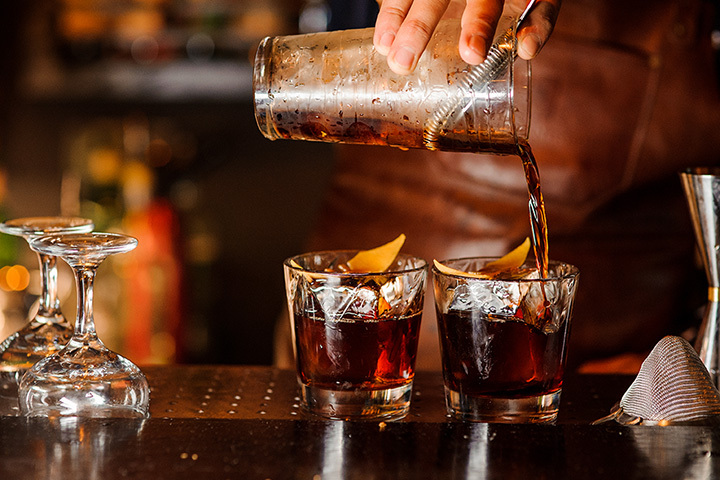 From secret libraries in boutique hotels to ultra-cool jazz rooms, here are the best speakeasies in Tennessee. Want to get inside? Just knock! Once you gain entry, you can grab a seat at the bar or table while you keep an open mind. There's no menu here, so every cocktail creation is truly one-of-a-kind. Let your imagination run wild. This “library” won’t sate your thirst for knowledge, but it can certainly wet your whistle. Tucked inside the boutique Oliver Hotel, this little speakeasy bar is quaint, cozy, and intimate. You don't have to be a guest to come grab a drink, but this amazing little hotel might just earn a spot on your travel list. This charming speakeasy house is about as mellow as they come. Even if you're not big into the bar scene, you can find solace and relaxation here while you sip on handcrafted libations. These aren't your average cocktails, so make sure you come with an open mind and a little bit of adventure. The Roaring ‘20s didn't die, they moved right here to Memphis! This classic speakeasy is a step back in time, but with all the modern comforts you're used to. Folks feel right at home here, being the type of place that's perfect for any occasion. They couldn't have chosen a better location in Nashville for this speakeasy. Tucked inside an old boiler room that was once the home of the biggest steam cleaning facilities in Nashville, it's like time has stood still for nearly a hundred years. In true speakeasy style, there is no sign, so look for the golden triangle painted on the brick around the door, and you're in. Potent drinks, amazing music, and the laid-back speakeasy vibe - it just doesn't get any better than this. If you want to find this place, you better be looking for it, (Hint: it's inside the Bari enoteca through an unmarked entrance), and you might have to wait a little while before you're able to enter. They keep their crowds low so everyone can enjoy themselves and get the full experience, and once you're in you'll certainly appreciate it. This speakeasy and jazz lounge is everything the 1920s was about: hearty cocktails and great music. With amazing live musical and burlesque performances, both past and present, you want to soak up every minute you're here. Truth be told, this place is a little hard to find being tucked in the alleyways, but it only adds to the intrigue. It's not often you find jazz clubs like this one outside of New Orleans. But the musicians here are as talented as they come. The prohibition-style cocktails and atmosphere make for a unique experience every time. This warehouse-style bar is low-key and worth telling your friends about. Their list of hand curated craft beers makes it hard to choose just one, so they might just become your new favorite hotspot for nightlife. Visitors say that an evening here rivals the speakeasies of bigger cities like New York, so you won't be disappointed.